Scottish Premier League bottom club Hamilton's relegation fears worsened after being beaten by Hibernian. Accies threatened when Simon Mensing headed against the crossbar before Mickael Antoine-Curier forced a save from Hibs goalkeeper Graham Stack. But it was the visitors who took a first-half lead when Richie Towell set up Akpo Sodje to fire home. 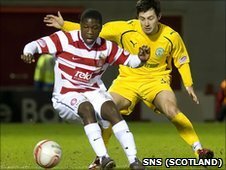 Derek Riordan tapped home Hibs second on 75 minutes before Flavio Paixao netted a late consolation for Accies. Hibs' fifth consecutive league win lifts them to eighth in the table, 16 points clear of Accies and three behind sixth-place Dundee United. Paixao's long-range free-kick was collected by goalkeeper Graham Stack as Hamilton tried to seize the early initiative. But the hosts survived a penalty claim when Callum Booth went down in the box following Mensing's challenge, referee George Salmond unconvinced that there had been a trip. Francis Dickoh and Riordan missed the target from close range as Hibs threatened with corners. At the other end, Mensing met Paixao's corner with a header that came back off the crossbar and Accies kept the pressure up to create an opening for Antoine-Curier to get in a strike, Stack blocking the striker's volley on the turn. The visitors went back on the attack and went in front in the 37th minute when David Wotherspoon released Towell down the right and the on-loan Celtic player's cut back was slotted into the net by Sodje. Hamilton's Mark McLaughlin found the net with a back heel but referee Salmond had already blown for a foul against the defender for his challenge on Stack. Stack received treatment following that collision but was unable to continue and was replaced by Graeme Smith before half-time. Hibs almost scored straight from the re-start as Liam Miller found space in the box and forced Tomas Cerny to parry a 12-yard shot wide. Accies probed for an equaliser with Antoine-Curier off target from a Paixao cross and Imrie's whipped corner flashing just past the far post. From another Imrie corner, Gary McDonald glanced a header goalwards only for substitute keeper Smith to block and home appeals of the ball having crossed the line falling on deaf ears. And Hibs were soon coasting as Sodje hooked the ball into the path of Wotherspoon, who crossed low for Riordan to side-foot home from seven yards. Hamilton did manage to get on the scoresheet but Paixao's volley from 14 yards after he ran on to Cerny's long free-kick was too little too late. 90:00+4:17 The referee brings the game to a close. 90:00+3:30 GOAL - Flavio Paixao:Hamilton 1 - 2 Hibernian Flavio Paixao grabs a goal from inside the box to the bottom left corner of the goal. Hamilton 1-2 Hibernian. 90:00+3:08 The offside flag is raised against Derek Riordan. Tomas Cerny takes the free kick. 90:00+0:38 Douglas Imrie concedes a free kick for a foul on Richie Towell. Graeme Smith takes the direct free kick. 90:00+0:38 Booking Douglas Imrie goes into the book. 89:29 Mickael Antoine-Curier challenges Callum Booth unfairly and gives away a free kick. Direct free kick taken by Graeme Smith. 87:54 Unfair challenge on Gary McDonald by Ian Murray results in a free kick. Simon Mensing takes the free kick. 87:54 Substitution Akpo Sodje goes off and Darryl Duffy comes on. 86:29 The offside flag is raised against Nigel Hasselbaink. Free kick taken by Graeme Smith. 85:19 Foul by Flavio Paixao on Martin Scott, free kick awarded. Callum Booth takes the free kick. 84:56 Handball by Martin Scott. Indirect free kick taken by Tomas Cerny. 84:29 Free kick awarded for an unfair challenge on Martin Scott by Gary McDonald. Callum Booth takes the direct free kick. 83:35 Mickael Antoine-Curier is ruled offside. Free kick taken by Graeme Smith. 83:03 The referee blows for offside against Akpo Sodje. Free kick taken by Mark Carrington. 82:16 Flavio Paixao is caught offside. Free kick taken by Graeme Smith. 80:40 The referee blows for offside against Mickael Antoine-Curier. Free kick taken by Graeme Smith. 79:28 Ali Crawford gives away a free kick for an unfair challenge on Ian Murray. Free kick taken by Graeme Smith. 78:17 The referee blows for offside. Tomas Cerny restarts play with the free kick. 77:04 Martin Scott concedes a free kick for a foul on Mark Carrington. Free kick taken by Tomas Cerny. 74:20 Assist by David Wotherspoon. 74:20 GOAL - Derek Riordan:Hamilton 0 - 2 Hibernian Derek Riordan gets on the score sheet with a goal from inside the area low into the middle of the goal. 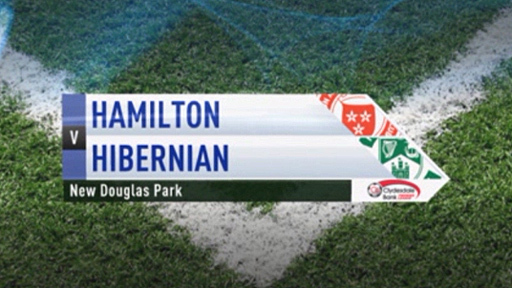 Hamilton 0-2 Hibernian. 73:55 Substitution Nigel Hasselbaink joins the action as a substitute, replacing David Elebert. 72:32 Douglas Imrie takes a inswinging corner from the right by-line to the near post, Gary McDonald takes a shot. Victor Palsson makes a clearance. 66:46 Corner taken right-footed by Derek Riordan to the near post, clearance made by Mickael Antoine-Curier. 65:20 Foul by Martin Scott on Mark Carrington, free kick awarded. Direct free kick taken by Tomas Cerny. 64:04 Akpo Sodje fouled by Simon Mensing, the ref awards a free kick. Shot comes in from Derek Riordan from the free kick, save by Tomas Cerny. 64:04 Substitution Ian Murray comes on in place of Liam Miller. 63:13 Unfair challenge on Liam Miller by Douglas Imrie results in a free kick. Richie Towell takes the free kick. 61:56 Mickael Antoine-Curier is flagged offside by the assistant referee. Graeme Smith takes the indirect free kick. 59:36 Flavio Paixao handles the ball and concedes a free kick. Paul Hanlon takes the direct free kick. 57:59 Douglas Imrie takes a inswinging corner to the near post. 57:17 Douglas Imrie delivers the ball, save by Graeme Smith. 56:59 Inswinging corner taken by Douglas Imrie, clearance by David Wotherspoon. 52:29 The assistant referee flags for offside against Derek Riordan. Tomas Cerny restarts play with the free kick. 50:15 Free kick awarded for an unfair challenge on Francis Dickoh by Mickael Antoine-Curier. Direct free kick taken by Graeme Smith. 49:19 Douglas Imrie decides to take a short corner. 46:44 Martin Scott gives away a free kick for an unfair challenge on Mark Carrington. Simon Mensing takes the free kick. 46:16 Jonathon Routledge gives away a free kick for an unfair challenge on Derek Riordan. Paul Hanlon takes the free kick. 45:01 Substitution Ali Crawford comes on in place of Damian Casalinuovo. 45:00+1:38 Inswinging corner taken by Callum Booth from the right by-line, Victor Palsson concedes a free kick for a foul on Tomas Cerny. Tomas Cerny takes the free kick. 45:00+1:12 Inswinging corner taken by Callum Booth from the right by-line played to the near post, Gary McDonald manages to make a clearance. 42:54 Unfair challenge on Richie Towell by Damian Casalinuovo results in a free kick. Paul Hanlon takes the direct free kick. 41:39 Unfair challenge on Douglas Imrie by Francis Dickoh results in a free kick. Mark Carrington crosses the ball in from the free kick, Mark McLaughlin challenges Graham Stack unfairly and gives away a free kick. Graeme Smith takes the direct free kick. 41:39 Substitution Graeme Smith joins the action as a substitute, replacing Graham Stack. 36:12 Assist by Richie Towell. 36:12 GOAL - Akpo Sodje:Hamilton 0 - 1 Hibernian Akpo Sodje scores a goal from close range low into the middle of the goal. Hamilton 0-1 Hibernian. 33:56 Unfair challenge on Akpo Sodje by Gary McDonald results in a free kick. Free kick taken by Liam Miller. 32:59 Flavio Paixao takes a inswinging corner from the left by-line to the near post, free kick awarded for a foul by Mark McLaughlin on Victor Palsson. Graham Stack takes the direct free kick. 32:31 Corner taken left-footed by Douglas Imrie from the right by-line, Paul Hanlon makes a clearance. 31:48 Inswinging corner taken right-footed by Flavio Paixao from the left by-line, Simon Mensing takes a shot. 27:59 Corner taken by Flavio Paixao, clearance by Akpo Sodje. 27:07 Foul by Victor Palsson on Douglas Imrie, free kick awarded. Mark Carrington takes the direct free kick. 26:43 Victor Palsson fouled by Jonathon Routledge, the ref awards a free kick. Graham Stack takes the free kick. 25:55 Foul by Akpo Sodje on Flavio Paixao, free kick awarded. Free kick crossed left-footed by Douglas Imrie from right wing. 24:35 The official flags Mickael Antoine-Curier offside. Graham Stack takes the free kick. 23:30 Corner taken left-footed by Callum Booth to the near post, Jonathon Routledge makes a clearance. 20:37 Callum Booth takes the outswinging corner, Effort from inside the six-yard box by Derek Riordan goes wide left of the target. 18:15 Liam Miller takes a corner. 17:41 Liam Miller decides to take a short corner. 11:56 Mickael Antoine-Curier fouled by Paul Hanlon, the ref awards a free kick. Douglas Imrie crosses the ball in from the free kick, clearance by Victor Palsson. 11:29 The offside flag is raised against Derek Riordan. Tomas Cerny takes the free kick. 11:17 The referee blows for offside against Douglas Imrie. Free kick taken by Graham Stack. 4:24 Victor Palsson gives away a free kick for an unfair challenge on Mark McLaughlin. Tomas Cerny takes the free kick. 3:28 Free kick awarded for an unfair challenge on Jonathon Routledge by Richie Towell. Free kick taken by Jonathon Routledge. 2:17 Free kick awarded for an unfair challenge on Mickael Antoine-Curier by Paul Hanlon. Strike on goal comes in from Flavio Paixao from the free kick, Graham Stack makes a comfortable save.